The 32nd Tokyo motor show | Yamaha Motor Co., Ltd. This is an American style performance machine dressed in a classic exterior. Taking the Royal Star as its base, this machine was customized around the concept of a "Wild Child." Old concepts were thrown out and free thinking brought in to create a sophisticated blend of classic styling and high-performance components like 6-pot caliper floating disc brakes and super-wide tires. This model proposes a new step forward in the evolution of the American style motorcycle. A riding position that brings to mind the stance of a football quarterback and a seamless-type frame construction that shows no welding are among the defining characteristics of the US Special. 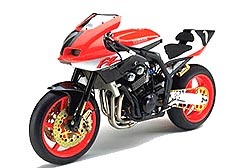 Offering a new variation on the American style bike, this is an exciting classic style version of the Drag Star which debuted at the last Tokyo Motor Show, went on sale a year later in 1996 and immediately established itself as a best seller. A revised grip angle on the upswept handlebars, a wider front tire, adoption of a larger diameter front fork and deep-arched steel fenders add refining touches to this classic styling. Based on the Drag Star Classic unveiled at this year's Tokyo Motor Show, this special version is dressed up even more to give a look of high-grade quality. 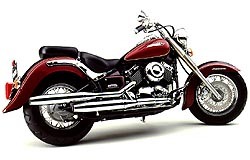 In addition to the leather tank cover, special seat and fin-type air cleaner cover and chrome plating on detail parts give an extra touch of class. This machine is completely decked out to bring ultimate enjoyment to the long run. Based on the new European model FZS600, this is a production racer that achieves outstanding competitive potential with the tuning of the intake/exhaust systems, combustion system and valve mechanisms. To ensure stable high power output, a large bay-shaped radiator is adopted. Great handling is guaranteed with an up-side down front suspension, and a 6-pot caliper front disc brake. All this gives this model exceptional competitiveness in tuned custom races everywhere. 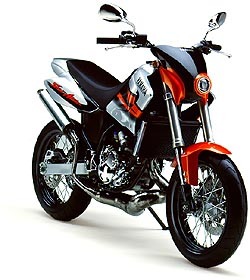 Based on the "Lanza" 2-stroke trail model with traction control system, this model combines the sporty performance of an off-road machine with street bike fashion sense and practical all-round functionality to offer a new street-and-off world of riding enjoyment. 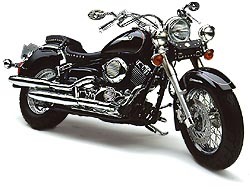 Besides the styling modifications on this Super Bikers version, it features 17-inch front and rear wheels, high-grip type tires, an up-side down front fork, special-design muffler chamber, modifications to the headlight assembly and short fenders front and rear that give this model its unique character. This model mounts a navigation system on the mountain trail bike Serow 225 WE to further expand its range of use. 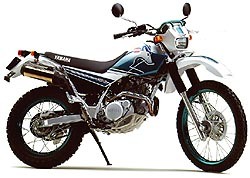 The motorcycle-type GPS navigation system is built into the meter panel. When destination latitude and longitude coordinates and planned route are input into the system it will automatically indicate the proper direction to take at road forks or intersections with an arrow. It also gives constant read-outs of present location coordinates. It is also possible to record and save data on points or routes discovered by accident. Data is also transferable to a personal computer. 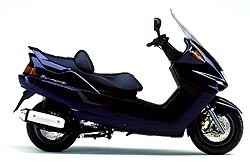 Featuring an array of new equipment, this model appears as a new sports version of the Majesty 250, which has won best-seller popularity in the 250cc scooter market as a new "sport sedan" since its debut in 1995. By optimizing the ratios of the V-belt transmission it achieves a sporty acceleration feeling, while the 2-pot caliper rear disc brake and enhanced suspension function guarantee agile footwork. The sporty image is further accented by features like a high-mount LED brake lamp, sports type muffler and black Alumite brake levers.